Saturday October 24 1908 It was a drizzling day. Will went to town after an early dinner I made my tatting handkerchief in the afternoon. I had it ready to put together for moths. I got a card from [Jennie Livesgood?] I read most of the evening. Fannie got home from Marshalltown. Sunday October 25 1908 It rained last night, quite hard and slowly all day. I was busy with the housework all forenoon and read and wrote what spare time I had. Will still complaining about his leg hurting him. Monday October 26 1908 Will went down to see the doctor about his leg this morning and I did the washing alone. I cleaned the garret in the afternoon. It was a hard job. 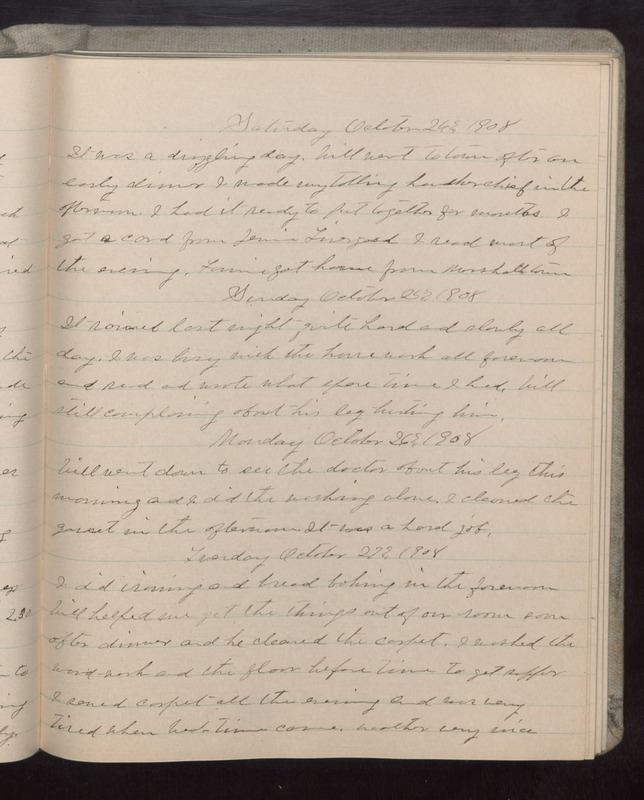 Tuesday October 27 1908 I did ironing and bread baking in the forenoon Will helped me get the things out of our room soon after dinner and he cleaned the carpet. I washed the wood-work and the floor before time to get supper I sewed carpet all the evening and was very tired when bed-time came. weather very nice.